Front doors can be much more than just a passageway into your home. When chosen well, they can complement your interior and exterior, or even show off your personality. Here are six beautiful doors, each in a distinct design style, that point the way. Extending the beautiful wood of the door beyond its borders tricks the eye, making the door appear much larger than it is. 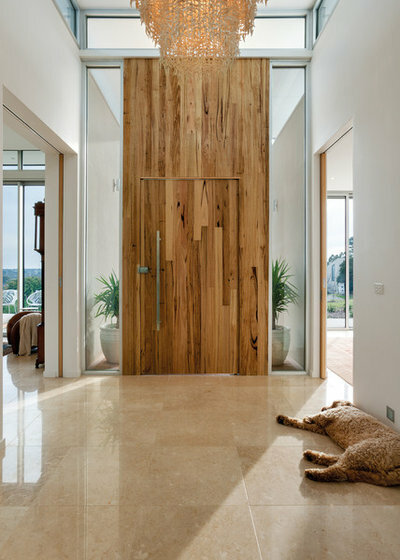 The wood also adds warmth to the contemporary lines and the clean white color of this entryway. 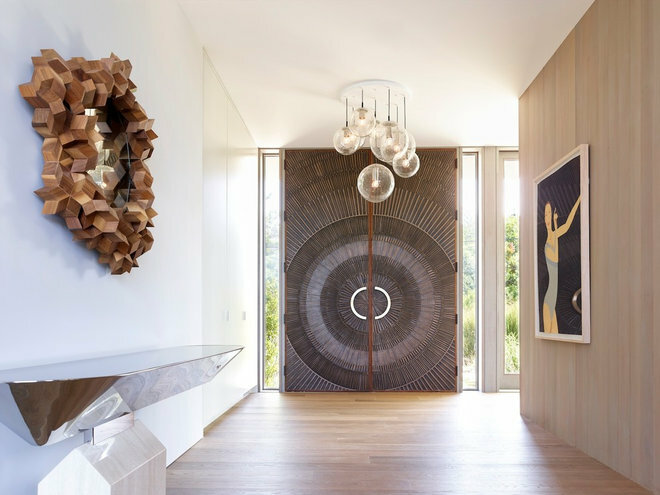 In this New York home, the bull’s-eye-like door hits the mark, thanks to an artistic design and an interesting texture. The dark color contrasts nicely against the light neutral exterior, while the circular shape of the handles reinforces the door’s overall design. This custom glass door with a beautiful wood vine overlay indicates a love of the artistic as well as the outdoors. 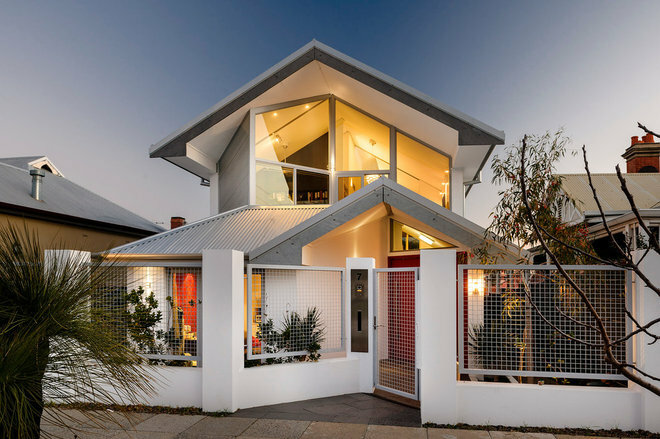 Plus, it has a lovely function: The glass allows natural sunlight to penetrate the home and engenders a visual connection with the front landscaping. A simple way to enhance your home’s appearance is to choose a front door that repeats architectural features of the home’s facade. 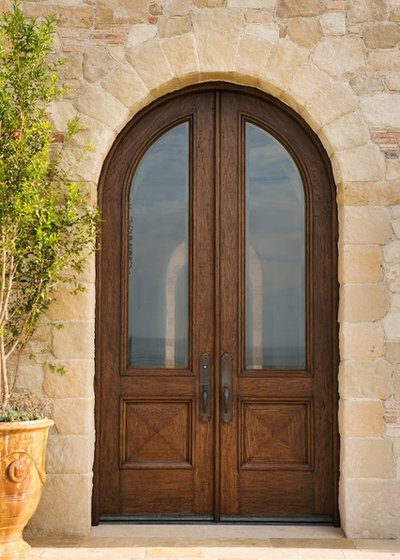 In this Mediterranean-style home in Southern California, the door shape achieves this . A wider shot of the home shows that the front door brings together multiple elements of the home’s exterior: The arched shape echoes the curves of the home’s front windows, while the color of the wood pulls out the tones of the roof as well as the beams above the rectangular windows. A splashy door might not seem right with a traditional home, but there is a subtle way to bring drama to the entrance. Here, the traditional elements that surround the black door — the sidelight windows and the arched transom — give this door a grander look. 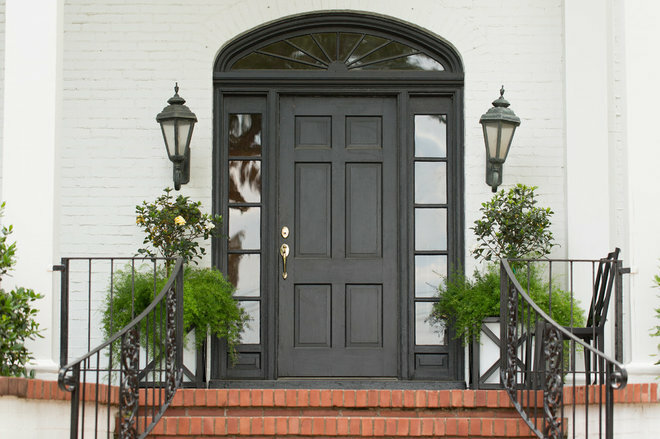 Plus, the classic black-and-white color scheme creates curb appeal that has staying power. Notice that the palette is consistent, with black repeated on the metal stair railing, light fixtures and the outline of the white planters. 6. Out of the box. Unique architecture often demands creative approaches, such as this door, which opens in an unusual manner. 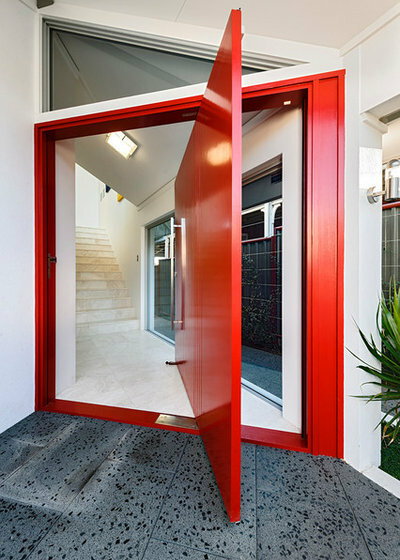 The quirky red swinging door fits the unexpected feel of this home. The red door also provides a sharp contrast to the white exterior, helping to delineate the entryway and ground this glass-filled home. Remember to call The Window Source of Des Moines for all of your replacement door and window needs!